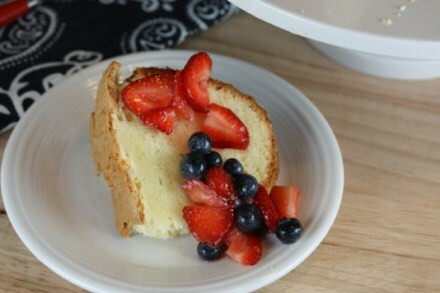 One of my favorite ways to serve fresh berries in the summer is over pound cake. The last few years I have tried several different plain gluten free pound cakes and I have not been thrilled with the results. This year though I was determined to come up with a gluten free pound cake because I have missed fresh berries over pound cake. And I love making trifles during the summer and pound cake is perfect for trifles. I turned to a tried and true sour cream pound cake that I have been making for years. 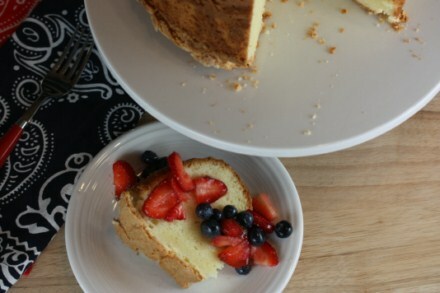 I adjusted and tweaked and finally came up with a version of a gluten free pound cake that we love. This pound cake has a bit of a crispy crust, which is a little different than the regular version that I used to make, but we actually really enjoyed the little bit of a crispy crust that it had. Overall this is really good and will now be my go to gluten free pound cake. 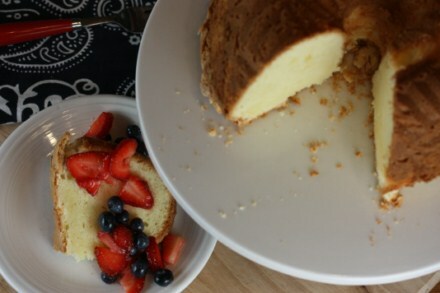 How do you enjoy pound cake? Do you eat it plain, with fruit, in a trifle, or some other ways? In a small bowl mix together the baking soda, sour cream, and vanilla. In another bowl mix rice flour, cornstarch, sweet rice flour, and xanthan gum. Add flour mixture to creamed mixture alternating with sour cream mixture. Grease a bundt pan and pour batter into pan. Bake at 325 for 1 hour and 15 minutes or until caked tests done. Cool in pan for 10-15 minutes and then remove from pan to cool on wire rack. Thank you thank you thank you. I love pound cake. From reading the ingredients and portions of ingredients used, I can tell this is an awesome recipe. And my daughter was just askibg about poubd cake too. Lynn-I just made your sour cream pound cake and it is wonderful! The best gf cake dessert I have had since starting the journey of gf eating. I seem to have a sensitivity to gluten but our daughter-in-law found out this past year she has celiac disease. This has made us pay much more attention to what we put into our bodies. Thank you for sharing what you have learned about gf cooking and baking. I am tying to find really good things I can make when our son’s family visit. Pound cake is a favorite if mine and I can’t tell you how excited I was as it cooked and how good it smelled ….like real cake :). Thank so much for sharing…you are helping us to adjust how we cook. Thank you for your kind comment. I am so glad you enjoyed the cake. My favorite way to eat it is with fresh fruit on tops. 🙂 I love helping others make the gluten free life easier, so I love hearing that you enjoyed this so much. Thanks for taking the time to let me know. So glad to find this recipe. I have a sour cream cake recipe that I have made for more years than I care to admit, but everyone loves it. My daughter in law recently found out she is gluten intolerant and my cake was one of her favorites. This recipe is so close to mine gluten-filled recipe so we are going to give it a try. We will be checking out more of your recipes and I will let you know how the cake turned out. Thank you so much for sharing! I hope you enjoy and your daughter in law enjoy it. And how nice of you to try to find a gluten free cake she can have! Lynn-can your gf sour cream pound be frozen? I am trying to cook ahead for thanksgiving!:). Thanks. I have not frozen this exact cake, but I have frozen other pound cakes and they have always worked fine, so I think this one would freeze fine. I hope you enjoy it and have a great Thanksgiving! I have found a great pound cake recipe in a random book I bought from Barnes and Noble. It’s an almond flour pound cake with cardamom. I normally make that, but we’re going to try this one for something different. I love it with strawberries and fresh whipped cream. Make this cake!!! It is awesome. I recently made for company, and no one could believe it was GF. I served with fresh blueberry sauce, which was really good but the cake didn’t need it. I am the Gluten intolerant one, but still love to bake and entertain. Add this recipe to your mix. I had to go to the Asian market for the sweet rice flour. Thanks for Sharing! I am so glad that you enjoyed it! I love it when readers share that no one can tell a recipe is gluten free. That is my goal! I love coming up with gf food that is easy and delicious! Thank you so much for letting me know how much you enjoyed it. Do I have to use the sweet rice flour, or can i substitute with all gf flour? The recipe is going to turn out best with sweet rice flour. Sweet rice flour gives desserts and other baked goods the best texture. So for the best results it is worth it to use sweet rice flour. Lynn, I made this cake; it was delicious! I now have how a request to remake it and add cocoa powder. How much should I add to this recipe? I have not tried that, but I love that idea. On the amount I am not sure…You would need to cut back on the other dry ingredients in order to do that. You usually can’t just add cocoa powder to it or it would be too dry. You would have to play around with the amounts. I might take a 1/4 cup of the rice flour and a few tablespoons of the other gf flours and use 1/2 cup baking cocoa. You might also need to add some sugar. Now that I think about it, I might just have to try it and see how it works with cocoa. It sounds like it would be really good.